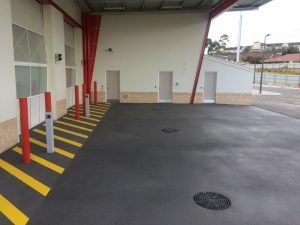 Continuing on from our last blog detailing our work with Albany Senior High School, we’ve also recently finished a resurfacing project for Albany Fire Station. The new Albany Fire Station was built as part of a $9 million project to replace the existing, heritage-listed station on Collie Street. 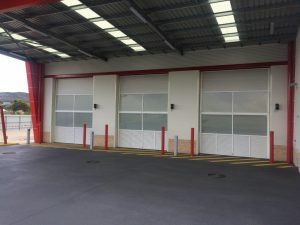 The new station is one of two facilities in Western Australia that have been built to improve response times to fires and emergency situations, and is located approximately 400km south of Perth on the corner of North Road and Bethel Way in Albany. Since the local firefighters had outgrown their previous base, the new station is fully equipped with dormitories, appliance bays, a breathing apparatus servicing area, plus a host of modern amenities, including a gym, study, kitchen and training area. Wespray On Paving was asked to resurface more than 800 square metres in the main appliance bay, undercover service area, and workshop and storage areas. We used our large volume texture spray machine to apply the seamless, slip-resistant Bluestone finish. The French grey fleck and yellow chevron line markings were then coated with an extremely durable polyurethane sealer to protect the finished surface against everyday wear and tear. This was an especially important part of the process as each of the areas we surfaced receive a lot of foot and vehicle traffic. We worked hard to ensure this project was completed on time and within the allocated budget, and we’re thrilled to have played our part in making this new fire station possible. The team at Wespray On Paving are experts at rejuvenating tired concrete surfaces, and service the local Perth area, as well as surrounding suburbs. 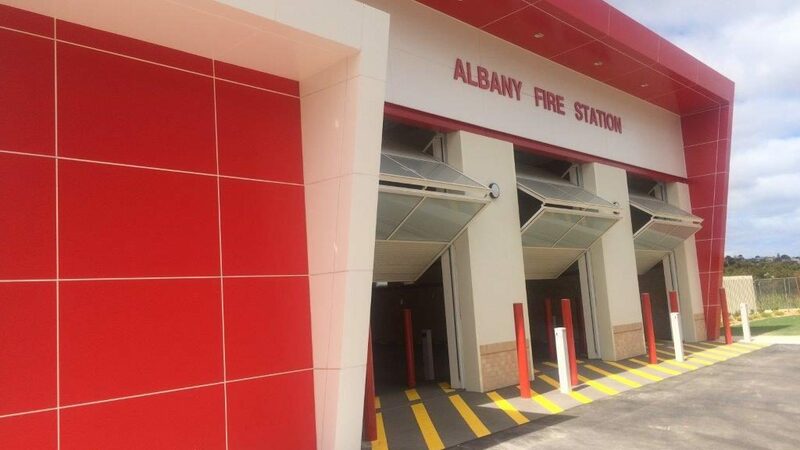 If you want to make your outdoor concrete surface as visually alluring and practical as Albany Fire Station’s new surfaced areas, contact us today! Hi! Someone in my Facebook group shared this site with us so I came to look it over. I’m definitely enjoying the information. I’m book-marking and will be tweeting this to my followers! Great blog and outstanding design.